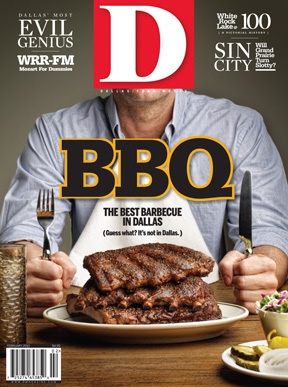 By Daniel Vaughn | 9 years ago The ugly truth: Dallas does not do barbecue well. Great BBQ joints are out there, but you have to search hard—and sometimes wide—to find them. Here’s our list of the top 16 barbecue joints in Dallas-Fort Worth, based on the essence of Texas ‘cue: sliced brisket and pork ribs. By Daniel Vaughn | 9 years ago Daniel Vaughn’s take on everything you need to know before you put that perfect bite of beef in your mouth. By Laray Polk | 9 years ago How will the Texas billionaire make his next billion? By burying hazardous waste in West Texas. By D Magazine | 9 years ago It’s only about 15 feet deep. It’s no Lake Michigan. But we cherish our humble urban oasis. A new book celebrates 100 years of White Rock Lake. By D Magazine | 9 years ago Half of all Americans will die of heart disease or stroke. You can avoid becoming a part of this bleak statistic by taking a proactive approach in protecting your health by becoming aware of your risk factors for heart disease and by taking advantage of the latest medical advances and technologies for early detection and intervention. By Nancy Nichols | 9 years ago Positioned to be the star of Uptown, Bella fails to steal the spotlight. By Teresa Gubbins | 9 years ago Thanks to delicious buffalo tenderloin, trendy desserts—oh, and Top Chef’s Tre Wilcox—Loft 610 is worth heading north. By Teresa Gubbins | 9 years ago With breakfast all the time, good fried catfish, and heavenly pie, this ’50-style diner merits our worship. By Nancy Nichols | 9 years ago The Belmont’s restaurant takes the farm-to-fork mentality too seriously—and service to the customer not seriously enough. Is Grand Prairie the Next Sin City? By Tim Price | 9 years ago When the Chickasaw Nation took over Lone Star Park, it had more than horses in mind. By Moira Muldoon | 9 years ago Dallas annexed the city across the Trinity more than 100 years ago. In many ways, it’s still a world away. By Trey Garrison | 9 years ago Choosing the city’s next police chief is a perilous task. So far, the Dallas city manager isn’t cracking. By Stephanie Quadri | 9 years ago Melanie Auld—wife of Dallas Star Alex Auld—creates pretty pieces that stand the test of time. Oh, and make the cover of O. By Joan Arbery | 9 years ago UTD’s residence program invites the world’s best to live better here. By Willard Spiegelman | 9 years ago The city-owned radio station does what it must to please the masses. But more refined ears have had enough. By Michael Darling | 9 years ago He created the preeminent website for board game enthusiasts. Which, yes, makes him a geek.